For T posts. Fits 1.25 & 1.33 lb/ft T posts. Large flange prevents arcing. 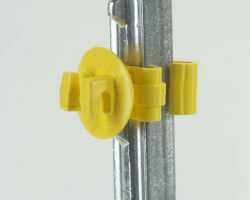 Solid wire holders for electric fence wire, polywire, and rope up to 8 mm. Snaps on and around post. Molded of high density polyethylene with UV inhibitors for all-weather performance. Extends wire 1".